Some jobs will never get listed in the want ads. Take Craig Wolfe’s gig for example. It’s a safe bet that he can claim to be the only CEO in the world to worry about what shade of lipstick to put on a “transvestite duck” or where he can find teeny-weeny shower caps for a slam-dunking duck named Moochie. Wolfe is the president of Celebriducks, a California-based novelty company that hopes to become the bathtub version of the Beanie Baby. Squeaking ducks based on the “Rocky Horror Picture Show” and Houston Rockets fashion daredevil Moochie Norris (“the first rubber duck with hair”) are but part of his flock of waterfowl with human faces. 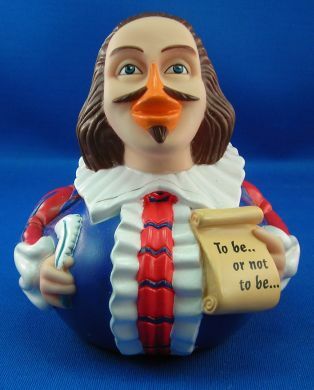 The current slate of celebrity rubber (actually nontoxic vinyl) duckies spans history (Queen Elizabeth), art (Mona Lisa), film (Charlie Chaplin, The Three Stooges), literature (William Shakespeare), music (Ozzy Osbourne, KISS, Beethoven) and sports (Babe Ruth, Kobe Bryant). Celebriducks retail for $11.99 a piece at Celebriducks.com and novelty and gift stores nationwide. Getting the rights to do a duck can be tricky. While professional baseball, basketball and hockey have signed off on athlete ducks, the National Football League is still negotiating terms. The Graceland folks refused to license an Elvis duck, citing a reluctance to approve any Presley caricatures. Before adding Groucho Marx to the flock, Wolfe had to track down all of Marx’s grandchildren for approval. And there’s no rhyme or reason for who says yes and who says no. Comedian Lucille Ball’s daughter nixed an “I Love Lucy” duck, but serious crooner Frank Sinatra’s estate is considering a deal. Last January, Celebriducks went from “an underground word-of-mouth phenomenon” selling about 10,000 ducks a year to the Big One Million. All the credit for going Platinum goes to Philadelphia 76er badboy Allen Iverson. A 76ers executive stumbled across Wolfe’s ducks in a newspaper article and thought it would be a great promotion to give away Iverson ducks to fans. The team had experienced huge success with a previous Iverson Bobblehead Night and an “Alien” Iverson beanbag Martian giveaway. The Iverson project also helped distinguish Celebriducks for its attention to detail. Putting cornrows, earrings and a tattoo on a duck “really brought us to another level,” Wolfe says. The ducks are not the first hybrid of cute toy and sports memorabilia. Beanbag teddy bears called “Bamm Beanos” were recently a fad. However, the face of the Roger Clemens bear looked exactly like the Mark McGwire bear. Celebriducks breaks new ground by attempting to represent an athlete’s distinct facial characteristics – such as Mariners star Ichiro Suzuki’s goatee. Customized ducks are now popular minor league and major league promotions. The Columbus Clippers, the Yankees’ AAA affiliate, commissioned a Derek Jeter duck. The Chicago Cubs gave away a special Sammy Sosa duck with floating bat (to be fair, all Celebriducks bats float). The Rockets created a buzz by offering an itsy bitsy showercap with their Moochie Norris duck. “At first, we couldn’t find any manufacturers in Asia who’d make a showercap that small,” Wolfe says. Chicago businessman Benjamin Goldman, who specializes in the unique combination of sports memorabilia and Jewish educational software, hired Wolfe to create his first Biblical duck. 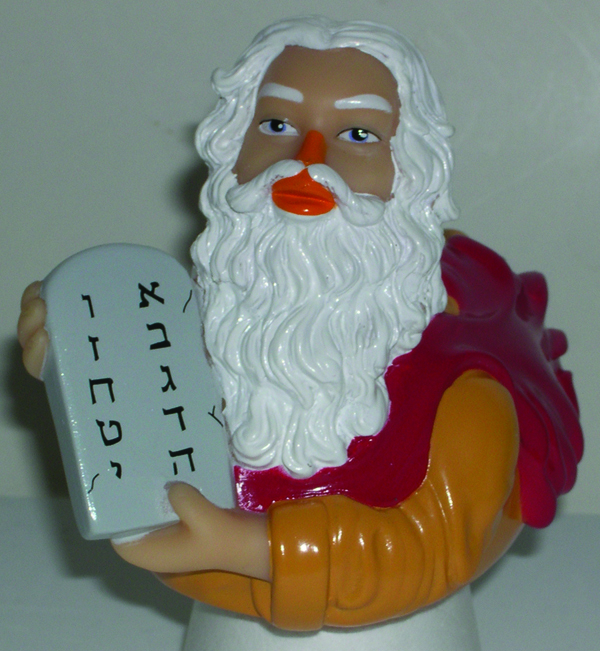 The Moses duck, complete with Ten Commandments tablets, is ready to part the waters in a tub near you. “Celebriducks are going to be the next big fad in America,” Goldman predicts, adding that most of his Moses ducks are finding their Promised Bathrooms across the Bible Belt. Wolfe says he can produce most custom orders (1,000 ducks minimum) for between $4,000 and $5,000, a price that includes the design and packaging. That cost threshold puts his ducks within reach for a small business to do a promotion or a nonprofit group to do a fundraiser. Locally, that opens up numerous duck possibilities. The Nashua Pride could do a Butch Hobson duck. The organizers of the Nashua Sesquicentennial celebration could commission Don Davidson and Bernie Streeter ducks in a “Great Gateway City Leaders of the 20th and 21st Centuries” series. And, just to spice things up a bit, the annual Boys Club Lucky Duck Race on the Nashua River could toss Mae West, Ozzy Osbourne and Nomar Garciaparra at the end of the pack. While Ozzy and Nomar continue to navigate soapy waters, there’s one popular duckling who might never get hatched. Wolfe says he gets many requests for a Jesus Celebriduck, but that he’s “struggling” with the idea of a duck who can walk on water. December 20, 2010 at 2:09 pm.12. I just received a Derek Jeter Celebriduck, and it kinda creeps me out . . .